Does Canon's first waterproof camera make a splash? 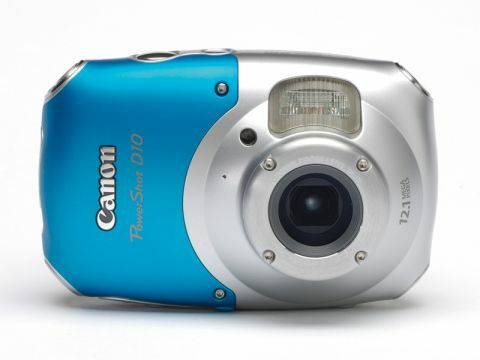 The PowerShot D10 is Canon's first attempt at a waterproof compact, and straight away it looks different from the rest. With a chunky, bulbous design that certainly looks the part, but which may have been needed to accommodate a larger, more conventional lens. The zooming and Autofocus speeds are average to good, but the zoom range is disappointing, especially at this price. The picture quality is decent, though; results were very sharp and the exposure and colours were reasonable. The Canon worked fine in freezing conditions, though the LCD display was more sluggish than at normal temperatures. Underwater, the D10 proved fine and the LCD's wide angle of view will prove useful for close-ups at awkward angles.